How to Selectively Backup iPhone Photos, Music, Videos and More? Backup iPhone is a good method to prevent data loss indeed, but how to choose what you want to backup on iPhone XS Max/XS/XR and more? Selective backup iPhone is a much more time-saving way than full iPhone backup when you just need to backup a small part of and certain data on your iPhone. So, this guide covers all types of iPhone data like photo, music, video, contact, message, etc and how to backup iPhone data selectively. As a professional iPhone backup software with encryption method, DearMob iPhone Manager allows you to not only fully backup iPhone XS Max/XS/XR etc at one stroke, but also selectively backup iPhone data and restore, like one or specific photos, songs, videos, contacts, messages, bookmarks, books, calendars, voice memos, podcasts, iTunes U lessons, files, etc. * Password encrypt the iPhone backup. iCloud Selective Backup: iCloud is the native way that Apple promotes to backup iPhone data. When you selectively choose which type of iPhone data to backup in Settings > [your name] > iCloud, iCloud will automatically backup them in the background when your iPhone is connected to the internet, locked and plugged into a power source. The stable and strong network is necessary to prevent iCloud backup taking hours or days problem and paying for more space will assure more files backup. As you can see, iCloud has some inconvenience, but more disappointingly is that it is impossible for you to selectively backup which one photo, contact or message manually. iTunes Selective Backup: Actually, iTunes is more suitable for iPhone full backup. When you need to selectively backup iPhone media files like audio and video, you can utilize it. However, contacts, messages, bookmarks and so on can't be selectively backed up to computer via iTunes. Worse still, iTunes can only backup built-in apps, so you are out of luck to use it to backup data of third-party apps. DearMob iPhone Manager Selective Backup: As mentioned above, iCloud and iTunes can't really satisfy your needs to backup iPhone data selectively like one photo, specific contact or certain message. So, here comes the third-party tool DearMob iPhone Manager that does truly help selective backup iPhone data and restore. You are allowed to manually choose and selectively backup iPhone photos, music, videos, contacts and more. Now, see how this iPhone backup software works below. How to Selectively Backup iPhone Data via DearMob iPhone Manager? How to Selective Backup iPhone Photos? On most iPhones, photos are the ringleader to kill iPhone storage space. Deleting iPhone photos works well to free up iPhone for more space, but it is painful to remove them all at once. So, it is advisable to choose to selectively backup iPhone photos which are precious and memorable for you to computer and then delete. No matter you want to selective backup iPhone Pano photos, selfies in Portrait mode or choose the favorite one from a bunch of photos taken in burst mode, DearMob iPhone Manager can help you. Step 1. Download DearMob iPhone Manger, install and launch it on your computer. Step 2. USB-connect your iPhone to computer, tap Trust This Computer to continue if there is a message on your iPhone screen. Step 3. 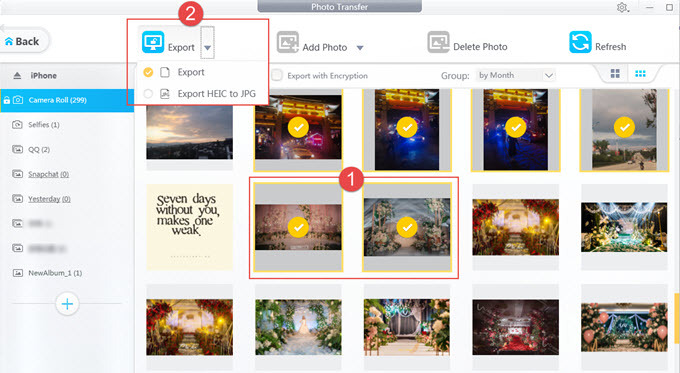 Click on Photo Transfer on the main UI of DearMob iPhone Manager, selectively choose the photos you want to backup to computer, then click on Export, and DearMob iPhone Manager will automatically backup iPhone photos to computer. * Any private or sensitive photos? You can check the "Export with Encryption" icon to encrypt iPhone photos with a password to safely save on your computer. * Need to view the HEIC photos that you backed up on Windows PC or Mac? You can choose to convert HEIC to JPG when backup to make them viewable. How to Backup iPhone Music Songs Selectively? Better than iTunes, either purchased Apple music or non-purchased songs can be backed up to computer via DearMob iPhone Manager. You can selectively backup iPhone music easily from your favorite artist, album or just by searching for their names in this iPhone data backup software. Vice versa, you are allowed to transfer downloaded music or ripped CD songs from computer to iPhone to enjoy on the go. Step 1. Assuming that you have installed DearMob iPhone Manager on your computer, just connect your iPhone to computer to make this software to recognize your iPhone device. Step 2. Click on Music Manager on the user interface of DearMob iPhone Manager. Step 3. 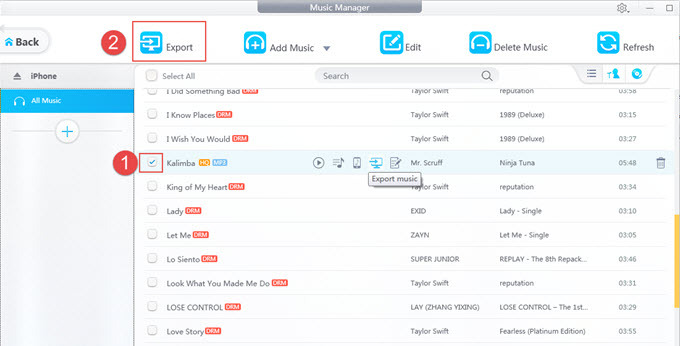 Choose the music songs you want to backup selectively, click on Export on the top bar to activate DearMob iPhone Manager to selective backup iPhone music songs. * If there is an iPhone ringtone needing backup, you can backup it. Plus, DearMob iPhone Manager can also make ringtone for iPhone to personalize your incoming calls. * When backing up encrypted music with DRM tag to computer, you are allowed to remove DRM protection of the Apple music and play it with common media player on computer. How to Selective Backup iPhone Videos to Computer? When 4K was first introduced in iPhone 6S, recording high-quality video anytime anywhere is much more convenient. High-res video means high-quality viewing experience but also means huge capacity occupation that your iPhone may not digest. A 20s 4K video at 30fps recorded with iPhone 6s is about 109MB, accordingly, a 3 minutes 4K video will take about 1GB and a 16GB iPhone may be fully occupied by a 50 minutes 4K video recorded at 30fps. Therefore, you are suggested to selectively backup iPhone videos that are huge and you like most and delete the useless ones to free up iPhone space. Step 1. Do what has mentioned above: get DearMob iPhone Manager on your computer, and USB connect your iPhone to computer to make them conmmunicate with each other. Step 2. Click on Video icon on the main UI of DearMob iPhone Manager. Step 3. Choose the iPhone videos you want to selectively backup and click Export to start backup. 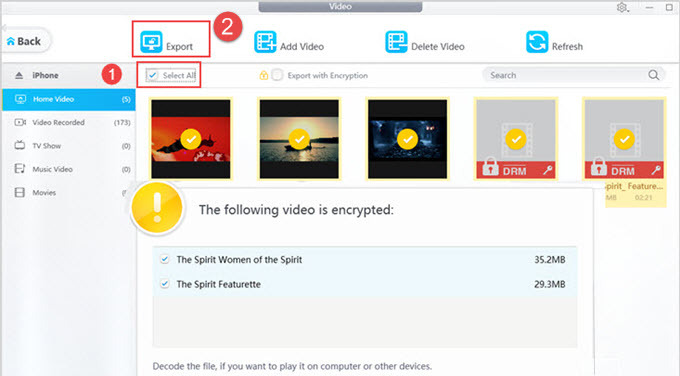 * Check on "Export with Encryption" allows you to password-protect your sensitive videos before backing up to computer so that no one else can view. * The purchased DRM movies can also be decrypted and exported to computer to be playable, and the decryption method is the same as remove DRM of Apple music. How to Selective Backup iPhone Contacts? When switching to a new iPhone, the first thing you may want to do is to transfer the contacts to new iPhone without any loss. With DearMob iPhone Manager, your important iPhone contacts will be safeguarded and you can selectively backup iPhone contacts one by one or in batch to computer. Simply, choose the contacts and Click on Export to backup to computer. You can choose to export your contacts to computer as VCF, PDF, TXT or HTML at will. Also, you can encrypt the contacts that are private to prevent prying eyes so that it is invisible even on a public computer or during the online sharing. DearMob iPhone Manager at the same time can automatically recognize the duplicate contacts to help you merge them easily. How to Backup iPhone Messages Selectively? iPhone Message app is powerful that can receive videos and images besides text messages, and these interesting, emotive or valuable contents from you and your families or friends can become a good memory in the near future. So, backup them is to protect your memory. However, each day you will receive one or more messages, precious or useless, and therefore you have to selectively backup these iPhone messages according to your needs. 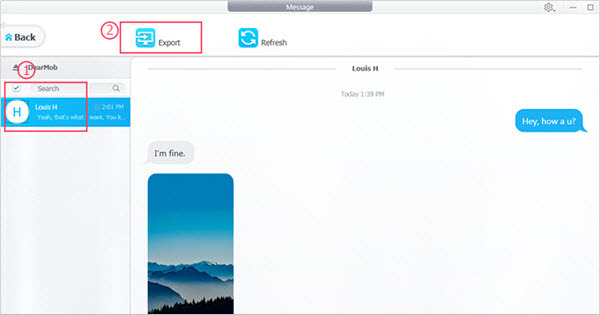 When connected iPhone to computer, DearMob iPhone Manager will show everything about your Message including the phone numbers, texts, images and videos. You can just scroll down in the left and choose which message to export for backup. How to Have iPhone Calendar Backup Selectively ? Why selectively backup iPhone calendars to computer? Simply, it is because you need them on your computer. No matter the recording of business meetings, friends' dating or colleagues' appointments, you can check them easily on computer when you have transferred them to computer. DearMob iPhone Manager gives you the chance to selectively backup iPhone calendars that you need most to computer, and check them easily when there is no internet. If there is any mistake of your calendar, you can manually correct them with this iPhone backup software as well. Creating contacts on iPhone using fingers is quite inconvenient, but this software makes things easier that you can directly use it to add a new calendar to your iPhone and also backup to computer. How to Selective Backup iPhone Files: Numbers, Pages & Keynote? Thanks to iOS 11, the long-awaited Files app finally comes out to allow users to manage files on iPhone like what they do to Word, Excel, PPT on Windows without the need of the third-party iPhone file manager app. Though the native Files app is powerful enough for you to handle iPhone files on your iPhone, shortcoming is that it is kind of inconvenient to manage iPhone files on such a small screen with your fingers. Why not choose a bigger screen when you have the choice? Selective backup iPhone files to computer is easy via DearMob iPhone Manager, and then manage the files with your mouse and type with keyboard on computer at will. How to Selectively Backup iPhone eBooks & Audiobooks? Have bought EPUB books, downloaded a PDF files or MP3 audio books? Want to open them on computer with bigger screen? DearMob iPhone Manager will help backup iPhone books including PDF, EPUB, DRM, MP3, etc ebooks to computer in an easy manner. Simply choose the ebook you want to selectively backup, and click on Export. DearMob iPhone Manager can backup the iPhone ebook without converting the format, or export EPUB book to PDF, TXT and HTML that Windows PC and Kindle can recognize easily. Vice versa, it can also help import books to iPhone iPad from computer if you found anything interesting on computer. How to Selective Backup iPhone Bookmarks to Computer? Have browsed various interesting sites using Safari on iPhone and bookmarked them at the same time? Want to keep them safe and access them easily in Chrome, Firfox or Internet Explorer on computer? If you don't know how to transfer a large number of browser recordings at one time, you may choose to type them one by one. Obviously, it's a huge and time-consuming task. 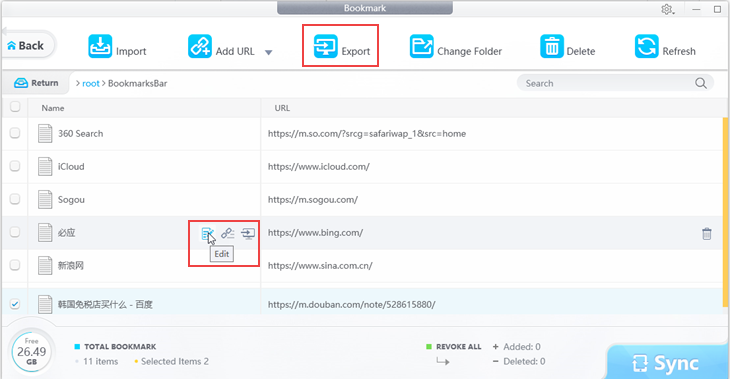 Therefore, you should refer to DearMob iPhone Manager to 1-click backup all bookmarks from iPhone Safari to computer at once, easy and time-saving. Vice versa, you can also import bookmarks to iPhone Safari from computer when there is any site interesting for you to enjoy on the go. How to Backup iPhone Voice Memos Selectively? Voice memo allows you to record anything important, like conversations, business meetings and report recordings. No matter you want to selectively backup iPhone voice memos to computer for usage in the near future or editing on computer at present, you need a tool to help you extract them easily. DearMob iPhone Manager makes that thing easy and at the same time delete the useless voice memos to free up your iPhone. How to Selective Backup iPhone PodCast & iTunes U? PodCast and iTunes U, the main ways for iPhone users to get knowledge and information, now can be enjoyed on computer. If you have downloaded the PodCast and paid for the iTunes U lessons, you can transfer them to computer via DearMob iPhone Manager to learn and have fun. Connect your iPhone to DearMob iPhone Manager, you can selectively backup iPhone podcasts and iTunes U, especially the paid lesson in large size, to computer for safe preservation and further enjoyment. No matter you choose to fully backup iPhone or just selectively backup iPhone data like photos, videos, music, messages, contacts, etc, DearMob iPhone Manager will try its best to satisfy your needs. As the best iPhone data backup transfer software as of now out the market, it outshines iTunes, iCloud and third-party iPhone file managers in the respects of fast speed, high quality, no data loss and multiple backup choices. So, just have a try!